If you’ve read Two Thousand Years, which I hope you have, then you know what a bad, bad boy Reylor is. The question you may find yourselves asking is, was he always this way? There has to be something that made him the way he is, right? Right? Well, let me tell you dear friends that this is the perfect opportunity to get into this villain’s head. Along the way you learn more about him, more about his background, and more about what made the future story come to pass. You also get glimpses of Treyan, Bria, and crew! There’s definitely some sibling rivalry! I highly recommend reading this one because you may possibly change your mind about how you feel about Reylor. Or, like me, you may even love him more than you already do! Great writing and perfect character development in this novella! 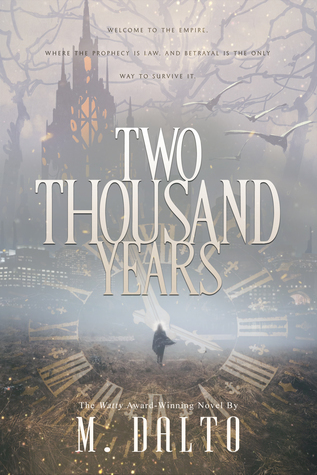 Two Thousand Years by M. Dalto is a New Adult Fantasy story of war, love, and magic!